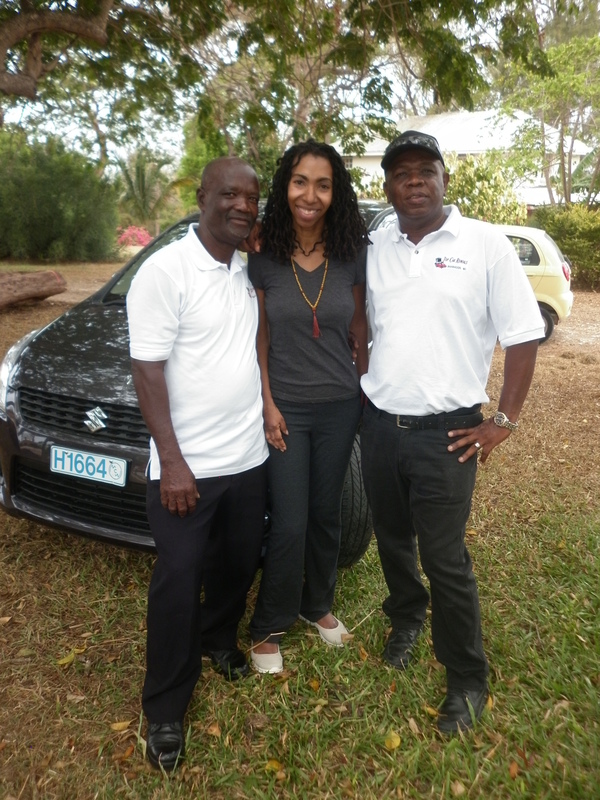 Saada Branker and Edwin and Angus of Top Car Rentals. It seems like self-inflicted cruelty to be picking up our pace in a place like Barbados. What has become the status quo in tightly-wound Toronto is almost ludicrous in sedate Walkers Terrace, St. George. Funny: I remember a friend once agreeing that navigating in Canada’s largest metropolitan city feels like being in a rat race. “But we’re not rats,” she added. Indeed. Bad habits die hard, even in Barbados. To get what we need on Hurricane Janet, I’ve been going at a steady pace of chasing interviews, setting them up, helping to coordinate the team, interviewing, researching and writing. Of course, I’m not alone. Joining me is a wonderful team of Fresh Milk blog coordinators and chasers including my editorial assistant Natalie McGuire. ArtsEtc’s co-founder Robert Sandiford provides us advice and links to key people. Filmmaker Powys Dewhurst, assisted by our intern, Charles Phillips, does all the driving, courtesy of Top Car Rentals as and as of week three, Southern Rentals Barbados. The film duo also does the heavy lifting, setting up equipment, filming interviews, capturing additional visuals and packing up. Microbiologist and acclaimed author, Alvin Cummins, signing his book, ‘Yeshua: aka Jesus the Nazarene’. Filmmaker Powys Dewhurst and microbiologist Alvin Cummins on the boardwalk discussing the Bridgetown Dry Dock. Truth is, to gather information about Hurricane Janet we need not just memories, but context. What was happening in Barbados in 1955? How were Barbadians living and how did they fare during the months of post-Janet recovery, especially as 20,000 people struggled to replace houses they lost to irreparable damage? What changed because of Janet? To help us answer these questions and lead to further queries, we secured more extraordinary Barbadians. On Wednesday, Charles and Powys set off for a day of streeters in St. Phillip—essentially newsroom jargon for quick interviews on the road posing one or two questions. In a rum shop filled with friendly, card-playing patrons, they found what they needed. Thursday, Powys and I set out to meet Alvin Cummins, retired microbiologist, award-winning author and treasurer of the Barbados National Union of Fisherfolk Organizations (BARNUFO). Through him we learned of government-imposed changes to the fishing vessels after Hurricane Janet, and the socio-economic challenges families faced years later. Alvin was a wealth of information, just like his colleague Buddy Larrier the week before at Oistins. We learned what a Dry Dock is and that the world’s last remaining structure can be found nearby in Bridgetown & its Garrison area. Craig Fernandez of Craig Fernandez Fine Arts Expression and Powys working well together. Kalil, skateboarder recorded by Powys and Craig. The strangest part of that day? A dynamic and loquacious photographer from Antigua named Craig Fernandez rolled up on us. In the course of a conversation, Powys eyed him carefully, thinking he saw a resemblance. It turned out he knew the artist’s father. To our surprise, Craig happily assisted us as 2nd camera for about three hours. Friday morning was spent at the Nation News headquarters where we met with Harold Hoyte, co-founder of the national newspaper and Editor Emeritus. His interview will shine in our documentary. Complementing Harold’s talk was the Nation’s Editor-in-Chief Roy Morris. It was a seamless film shoot thanks to the staff, in particular, Sonia Marville-Carter. Her coordinating skills ensured our time went smoothly and efficiently. Harold Hoyte, Co-founder & Editor Emeritus at The Nation. Roy Morris, Editor-in-Chief at The Nation with Saada and Powys. We’re finding it hard to slow down. There’s something spectacular about learning of a shared moment from people with a comprehensive understanding of impact, whether they’re met on the road or in a newsroom. As each of these keen interview subjects point the team in a particular direction, we can’t help it; our excitement takes over and we find ourselves quickening our pace.